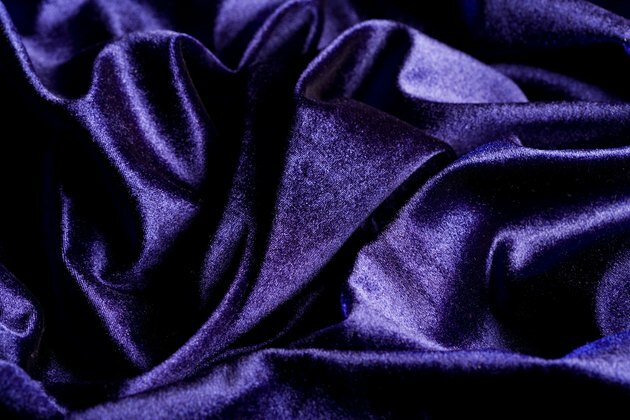 Soft and lustrous, velvet fabric requires special care and cleaning to prolong its life. When ink stains velvet, the delicate nature of the fabric means improper removal could cause more harm than good. Fortunately, you can safely remove the ink and restore the look of the velvet using inexpensive items found around the house. Velvet is available in a wide array of colors. Cover a flat surface with a white towel. Lay the velvet on the towel with the ink stain facing up. Create a soapy mixture with 1 cup of cool water and the liquid dish soap. Whisk the soap and water together until foam forms. Use a white cloth to scoop the foam up, and blot the ink stain gently. Start at the edge and blot while moving in toward the middle. Rinse the soapy residue off the velvet with a clean, soft cloth dampened in cool water. Dip a cotton swab in rubbing alcohol and blot any lingering ink stains. Discard the cotton swab when soiled and saturate a clean one in rubbing alcohol. Continue blotting the ink stain until it is no longer visible on the velvet. Blot the rubbing alcohol off the velvet with a damp cloth. Let the velvet air dry away from direct heat. Brush the velvet nap with a velvet and suede nap brush when the fabric is dry.